You may have heard about new home design apps for the iPad and iPhone that allow you to visualize your new kitchen or bath in the early planning stages so that you can take a good plan to a designer when you’re ready. But for those who don’t have an Apple device with which to use these apps, you now have another great option: NKBA’s new free Virtual Planning Tool. Powered by 20-20 Technologies, the same technology driving the software that our own designers use, you can start visualizing your dream kitchen, bath, or even laundry room. 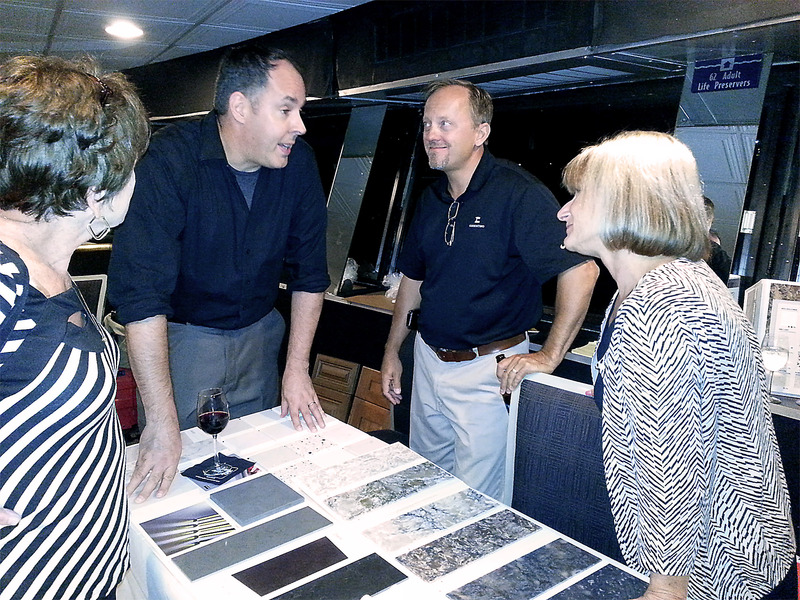 This tool allows you to look through potential colors, layouts, and even appliance options. This tool is an excellent way to gather ideas for your new room and have a visual guide to see what you like or don’t like so that you have a very good idea of what you’d like to include in your new space. As said before, this tool is completely free. You can create an account to save and load your designs, but it isn’t required. 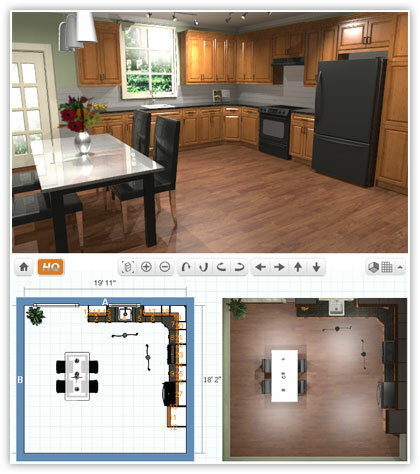 Click here to download the Virtual Planning Tool from NKBA. 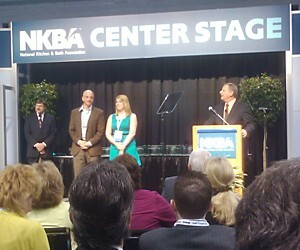 Jessica Williamson Wins Award in 2010 NKBA Contest! Kitchen Views proudly announces that Jessica Williamson of Kitchen Views Custom in Newton, MA won 2nd place for Best Small Kitchen in the nationwide 2010 NKBA design contest, which was awarded at KBIS on April 16, 2010. She was accompanied by Manny Pina, President of National Lumber, and Brandy Souza, Assistant General Manager of Kitchen Views. 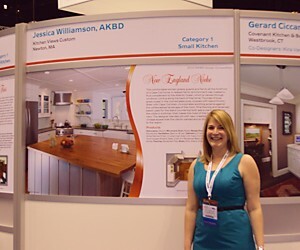 Jessica is seen standing in front of a picture of her award-winning small kitchen design. Story: This comfortable kitchen greets guests and family at the forefront of a Cape Cod home. A relaxed family environment was created in fluid complement to the Atlantic Ocean, which is viewed through windows running along the back of the home. Touches of blue-green ocean in the colored glass pulls, coupled with Island Knotty Alder with Cape Cod stain, incorporates soothing accents against the whitewashed landscape of the room. 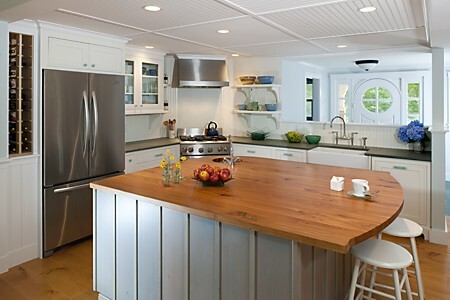 Pine flooring and reclaimed beech used for the island countertop both add a warm balance to the white in a kitchen that makes the most of the home’s ocean view. The designer blended old with new, creating the relaxed vintage appeal that the clients wanted and so timelessly inherent to the region. HGTV Audience Choice Award Winners will be posted on or about April 23, 2010. More photos from Jessica’s portfolio will be featured on HGTV.com in the near future. Jessica’s kitchen is featured here on HGTVpro. 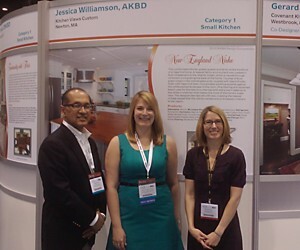 We are pleased to announce that one of our designers, Jessica Williamson of the Kitchen Views Custom showroom in Newton, has been selected as a finalist in the 2010 NKBA Kitchen Design Contest in the small kitchen category. This kitchen is featured on the cover of the Fall 2009 issue of Kitchen Views’ design magazine (PDF). This comfortable kitchen greets guests and family at the forefront of a Cape Cod home. A relaxed family environment was created in fluid complement to the Atlantic Ocean, which is viewed through windows running along the back of the home. Touches of blue-green ocean in the colored glass pulls, coupled with Island Knotty Alder with Cape Cod stain, incorporates soothing accents against the whitewashed landscape of the room. Pine flooring and reclaimed beech used for the island countertop both add a warm balance to the white in a kitchen that makes the most of the home’s ocean view. The designer blended old with new, creating the relaxed vintage appeal that the clients wanted and so timelessly inherent to the region. You can see all of the entries at the HGTV website. Also, you can visit the “New England Niche” kitchen on HGTV by Jessica Williamson here.